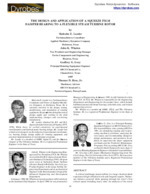 M. E. Leader, J. K. Whalen, G. G. Grey & T. D. Hess Jr., 1995. A critical multistage steam turbine in a large chemical plant experienced high vibration levels and frequent repairs. Numerous failures occurred while passing through the rotor’s first critical speed including heavy rubs. An analysis of the rotor/bearing system dynamics revealed that the rotor was highly sensitive to unbalance. Several different solutions were modelled and evaluated. Modifications to the shaft were rejected and modifications to the machine case were too costly and too time consuming. A combination tilting pad journal bearing encased in a squeeze film damper was proposed along with the addition of two nonfunctional “dummy” wheels that lowered the first critical speed, improving the separation margin. The damper is supplied with normal oil pressure that then feeds the journal bearing. This solution was implemented, resulting in a significant reduction in rotor amplification factor from 14.8 to 4.2 and greatly reduced vibration amplitudes throughout the operating speed range eliminating the rotor rubs. This machine is now operating well and has survived many startups and shutdowns without incident.